Terry Yorath says the Football Association of Wales would be "foolish" not to secure Chris Coleman's future as national team manager. Coleman's Wales contract ends after Euro 2016 in France in June, their first major tournament since the 1958 World Cup. Yorath said: "If they got rid of Chris or Chris happened to leave, where would they go?" The former Swansea and Bradford boss fears the situation between Coleman and the FAW could mirror events surrounding the end of his time as Wales manager. The FAW and Yorath did not come to an agreement during Wales' 1994 World Cup qualification campaign, and he left the role. "Chris has done very, very well. 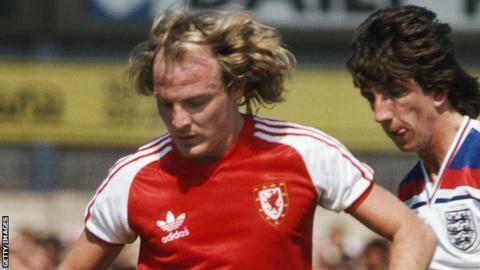 He's handled himself and the team very well," added Yorath. "I don't know really what they hope for. "Chris is Welsh. I know for a fact that he likes the job - he loves the job, I've spoken to him many times. "And I think the Welsh FA would be foolish not come to some kind of agreement with him." Wales just missed out on qualification to the 1994 World Cup when they were beaten 2-1 by Romania in the final qualifying match in Cardiff. Yorath says Coleman has experienced players to call on, but not to the same extent of his team which included Ian Rush, Mark Hughes and Neville Southall. "The Welsh squad at the moment is quite young," said Yorath. "Those players obviously need leaders. They've got them in Ashley Williams, they've got it in (Gareth) Bale, (Aaron) Ramsey - people who have played at the highest level. "But you always need that one figure and Chris Coleman is that figure at the moment. "From what I read and what I've heard the players all admire him. "They all think he's doing a great job and I think it would be really, really sad if he left the job."